NES Nuts & Milk (JPN) "100%" in 14:06.07 by klmz. 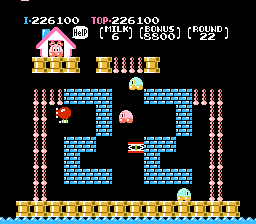 Nuts & Milk is a platform game deriving influences from a number of famous Nintendo games, including Kirby (puffy pink blob as a protagonist), Mario Bros. (green and red fireballs), Donkey Kong Jr. (spring platforms, jumping from ladder to ladder and fruits) and Wrecking Crew (barrels). This improvement of 15.22 seconds over the previous published movie collects all the fruit in all stages, including the bonus round (the latter of which triggers the 'PERFECT' ending).